The Australian Gems (U19) are the queens of youth international basketball in France at the moment. They completed a clean sweep at Fougères to make it 7 wins from 7 matches in France. The Gems beat Brazil on day 1 (75-54) behind a strong performance by Stephanie Talbot with 17 points. Vanessa Panousis, Carley Mijovic and Casey Samuels added 13, 12 and 11 points respectively. For Brazil Isabela Ramona had 17 points. On day 2 Australia dropped their guard after leading China (20-4) in the first quarter and were pushed all the way to the end before finishing with a 9-1 run to win (84-73). Talbot was yet again the leading scorer with 17 points. Alex Wilson joined Panousis, Mijoibic and Samuels in double digits scores. 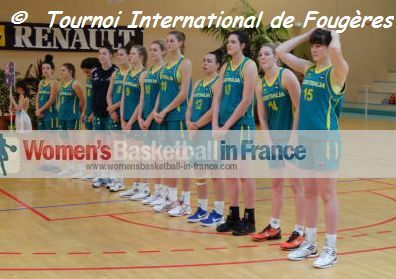 Australia then faced France U20 in the final match and the supporters were given a thrilling youth international basketball match with 17 lead changes and 11 ties. Australia were rewarded for their risks which resulted in them hitting 23-of-26 free throws as they beat France (67-57). Carley Mijovic appears to like playing against France as she knocked down 21 points (7-of-10) from the floor while Wilson and Darcee Garbin were the only other players in double digits with 10 points each. For France U20, it was a case of having a bad shooting day as they went 23-of-77 for the day (30%). Marie-Bernadette Mbuyamba was the leading scorer for France with 17 points. In the game for third place Brazil prevailed against China in a thrilling contest (66-64). Maria De Oliveira and Estela Gregorio fired in 24 and 22 points for Brazil while Hengy Yang had 16 for China.